Would Microbes From This Astronaut Make It Impossible For Anyone To Terraform Mars - Ever? Supposing we do eventually decide to terraform Mars, and know how to do it, will it be possible at all if humans visit the surface of Mars first? Could aerobes and other microbes introduced by humans work against all our attempts to terraform the planet? There are more immediate issues to think about such as need to keep Mars pristine for present day scientific exploration. Also, I am not yet at all sure myself that terraforming is the best way forward, or that we are anywhere close to the level of knowledge needed to do it successfully. But it is not too soon to start thinking about this possibility. 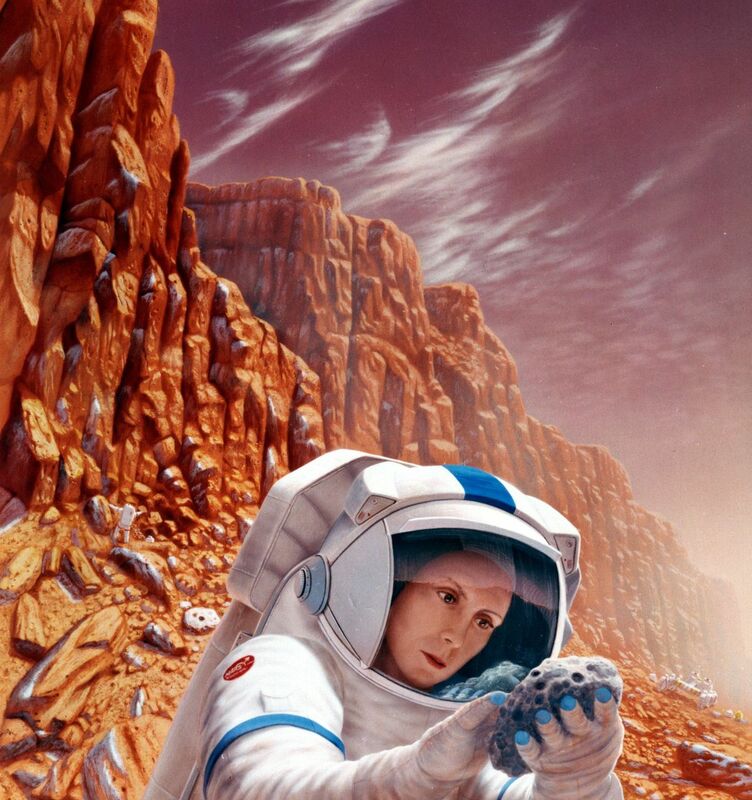 Here is a 1980s pleasantly retro drawing of an astronaut on the surface of Mars. Would the trillions of microbes she carries with her to Mars make terraforming Mars impossible? This is something I've never seen mentioned on all the literature on the subject. Yet to me it seems obvious she would. What do you think (after reading the rest of this blog post)? There are two strands of thought here, one about contamination of Mars, and the other about terraforming and ecopoiesis. First, it now seems inevitable that humans landing on the surface of Mars would contaminate it with spores and other forms of microbial life at least in a dormant, viable state. Also it seems that these dormant microbes would remain viable for long periods of time, and once they are spread, perhaps in the dust storms, can't be removed from the planet. Second, terraforming as usually described needs life. You have to do mega-engineering as well, because Mars is so different from Earth that you can't do everything biologically. But once that is done, you then have to set up various life cycles to keep the atmosphere and ecosystems in balance. So, how can you get started on this ecosynthesis from a Mars with no life, or very sparse life? The usual answer is to use new species a few at a time, mirroring the way that life started on our planet, but more quickly. The geneticist and biophysicist Robert Haynes called this process Ecopoesis. So the problem is, if Mars gets contaminated with the long lived spores from a human settlement, would Ecopoesis still be possible? "Marsforming" is a word I use to describe Christopher McKay's idea that if interestingly different native life is found on Mars then we might prefer to create conditions suitable for that life to flourish on the planet. We might try to reproduce the early Mars conditions, whatever they were. Or we might make it more hospitable for present day Mars life, rather than make it more hospitable for present day Earth life. Could these mysterious dark spots harbour present day Mars lfe? Found near possible Martian Geysers. Some think they may have a partly biological origin. Or, could this "desert varnish" harbour present day Mars life? A minority view holds that the desert varnish on both Earth and possibly Mars may be caused by life. Christopher McKay has talked about the need for all exploration of Mars to be biologically reversible (youtube video), in case we decide to "Marsform" Mars, to make it more habitable for native martian life. For some reason, though, no-one seems to mention this same thing as an issue with Terraforming Mars, at least none of the papers I've read so far. But it seems to me that our explorations might well need to be similarly biologically reversible, even if there is no native life there, and nothing of any biological interest at all on Mars, in case we decide to terraform Mars. Over periods of hundreds of thousands of years, cosmic rays destroy all dormant life in the top 7.5 meters or so of Mars soil. But over shorter periods of time, then life is astonishingly resistant. Expose E Experiment on the ISS. Used for some of the Mars UV and cosmic rays simulations. 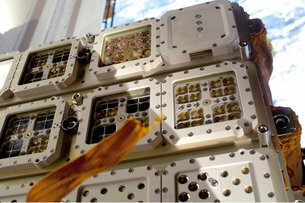 Other experiments explore simulated Mars environments in laboratories on Earth and come to similar conclusions. However, it's been shown in many experiments with simulated Mars environment, that endospores can survive for years even on the surface of Mars if shaded from the sun. That is a long enough time so that a dormant lifeform or endospore could get into a crack in a grain of dust, then get blown around in the global dust storms on Mars. It could end up anywhere. For instance it could get blown into one of the caves discovered on the surface of Mars. Sometimes skeptics about life on Mars say "oh yes, but the soils are toxic to life". That was a preliminary conclusion from the early Viking experiments. But newer discoveries show that the soils on Mars are varied and also even the percholrates are not nearly as toxic as was once thought. They are only mildly biotoxic and micro-organisms can survive them. And there are many other types of soil on Mars including alkaline soils, clays, salts etc. Then studies of the human microbiome show an astonishing range of species and genera. There is a big project to try to characterize it, the Human Microbiome Project. But at present no-one really knows what is there. There are estimated to be over 10,000 species living on or in humans. The total number of non human cells in your body is estimated to be ten times the number of human cells, for a total of 100,000,000,000,000 (100 trillion) non human cells in a typical human being. Just your skin flora has about a trillion cells, 1,000,000,000,000 just on your skin, in a thousand species and 19 different phyla. There are typically something in the region of a thousand micro-organisms in every cubic meter of air as well. Spacesuits on Mars and airlocks would leak air all the time. There is no way a human base on Mars can be set up with the cleanliness of a biohazard laboratory, and so inevitably trillions of micro-organisms are going to end up transferred to the surface of Mars. Then, if anyone dies on Mars e.g. in an accident in their spacesuit, or because their spaceship crashes, that deposits those hundred trillion micro-organisms on the surface. These species are in many different genera too. So would include aerobes and anaerobes, methanogens, etc. They would include many archaea that are poorly understood just known from fragmentary gene sequences. There would also be multicellular orgamisms too, and unless extreme care is taken to exclude them, likely to include the likes of the polyextromophile tardigrades (see also tardigrade facts) and lichens brought in on soil or in the air. 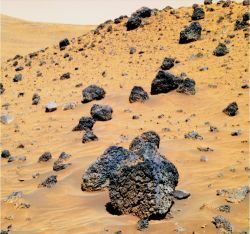 Some of these organisms may be able to replicate on Mars, as there may well be sparse possible habitats for life on Mars, even on the surface, and there are extremophiles able to live in similar conditions on Earth. See Might there be microbes on the surface of Mars. So Earth life may be able to survive on Mars right away. But to be a contamination issue on Mars for terraforming, it doesn't need to replicate. It just needs to form long lived spores or dormant states. Spores on Earth have been found to survive for thousands of years, and possibly for millions of years . Cosmic rays destroy dormant states such as spores in the first few meters of the soil - but this process only happens over periods of hundreds of thousands of years - and only penetrates to a depth of 7-8 meters. A spore that contaminates a dust grain on Mars, has plenty of time (at least 533 days) to get blown into a deep crevice or cave on Mars and once it does that, it is shielded from cosmic rays. It could then remain viable for at least thousands of years, on Mars, and quite possibly longer. It could be a problem not just for us but for future attempts to terraform Mars for millennia. This is work in progress, with many experiments continually being done to simulate Mars conditions more accurately, both on Earth and in the ISS, and to do the experiments for longer time periods. However the experiments and research so far continue to show that micro-organisms are more capable of surviving Mars surfaces conditions than expected, especially in dormant states. The life cycles of ecosynthesis seem to be essential for making any planet habitable for Earth life, even just for plants. Without those, Mars would quickly revert to its current state most likely, too cold and inhospitable for anything except microbes living life on the edge. In a synthesized Earth like ecosphere, oxygen and carbon dioxide could be created or depleted over quite short time periods if not kept in balance by life cycles. Other gases like methane, hydrogen sulphide, etc. could also build up in an atmosphere if not kept in balance at Earth normal levels by life cycles. Then the life forms themselves need to be in a balance so that the life you want is in abundance and problematical forms of life are under control. For instance you want plants to grow, and not be eaten before they get started, or be continually plagued by pests and diseases. There are many studies of this. Generally though, the idea is that you introduce cyanobacteria and other oxygen forming micro-organisms at an early stage. You might also use methanogens to create methane for its usefulness as a greenhouse gas. At a later stage you introduce higher plants. You only introduce oxygen breathing multi-cellular life and humans at a very late stage (which might never be reached on Mars, if so the humans live in habitats). This is a long essay on the topic by a micro-biologist: Some Ideas Regarding the Biological Colonization of The Planet Mars. It gives some idea of the details you would need to look into when you make a start on ecopoesis on Mars. So first of all as with all the Mars terraforming proposals, you have some form of megaengineering- with mirrors or nuclear explosions (another option is to divert comets and asteroids to impact with Mars). He just briefly discusses this as it is not the main focus of his essay. Once conditions are somewhat more habitable on Mars you then start to introduce life to it. The ecosystems created on Mars must be permanently supervised by human, their behavior influencing the colonization plan. The introduction of life on the planet must be realised gradually, according to a colonization plan. In order to conceive this plan, it is necessary to know and to understand the great biogeochemical cycles, the relationships between various species and between these and their environment. "Chroococcidiopsis sp. This cyanobacterium, studied by professor Imre Friedmann, is adapted to aridity and to large temperature variations. It is found from Antarctica to tropical deserts. It defends itself from the strong ultraviolet radiations by living under small translucent pebbles (it is endolithic). When life conditions become more favourable, it easily gives up the territory to more advanced organisms. It is photoautotrophic, producing oxygen. "Matteia sp. is a filamentous, desiccation resistant, cyanobacterium. It is photoautotrophic. It can fixate atmospheric nitrogen when this element is absent in the enviroment. More important, it dissolves carbonates, releasing carbon dioxide and accelerating the greenhouse effect". (Friedmann, 1993). Also you could use the genes of the amazingly resistant Deinococcus radiodurans in genetic engineering to improve micro-organisms ability to survive on Mars. You could start by creating habitats beneath the ice. Indeed those may form naturally when comets impact with the Martian icecaps and melt it, this can form lakes that are covered in a crust of ice and stay liquid for surprisingly long periods of time, up to thousands of years for a large impact. "Of course, long before these pioneer-organisms could colonize the planet's surface, life could grow in biological enclaves, isolated from the unfavourable environment. As shown above, thermal waters could be directed to depressions in the crust, forming lakes. the ideal location for such lakes would be in the equatorial regions of the northern hemisphere, close to the demarcation line, in areas rich in nitrates and carbonates. Although, most of the time, these lakes would be covered by ice crusts, beneath the ice, temperatures ould grow towards the "spring". In such artificial lakes a great variety of cyanobacteria and algae could grow. Then, the global warming would melt the ice and would inundate the areas close to the demarcation line, creating large water basins where the algal populations would quickly expand. "On our planet, gaseous CO2 represents a very small part of the atmospheric composition. On Mars, it forms and it will form most of the atmosphere. It is here that the carbon cycle must start. How would it look like? In the first stages of terraformation, human activity and the presence of a phytophagous [i.e. plant eating] fauna are, obviously, excluded. ..."
He then talks in detail about how an alternative form of the carbon cycle would be setup on Mars, and about the micro-organisms best suited for it. He suggests that for a long time the cyanobacteria should be used, many fix nitrogen, some disolve carbonates to create CO2. First dessication resistant cyanobacteria that grow inside rocks to start with. Then organisms from Antarctic lakes as the first water pools form. Then algae introduced. Then as oxygen increases, cyanobacteria able to erode rocks. As seas form, then microscopic algae. He then talks about establishing nitrogen cycle, sulfur cycle, phosphorus cycle. Only after all that is completed do you introduce the first multi-cellular life. Which would start with lichens, mosses, algae and plants. Then larger plants are introduced, and then finally animals. First primitive animals and insects. Plant eating and carnivorous animals, and decomposer organisms then added with great care. This is just one example, and there are many other examples in the literature. See the find out more section below. Also your aim can be full terraforming as far as possible, or partial terraforming e.g. just to have plants grow on Mars (not animals or humans), or to let Mars find its own state, somewhat guided by humans, or Mars forming as in Chris McKay's approach. You also have intermediate ideas such as paraterraforming where you cover most of the surface with habitats, which is where the humans live, and you may have some plants living outside the habitats. I have also wondered if paraterraforming might be a useful step towards terraforming. Especially if we can create self replicating seed factories (with proper precautions of course to prevent unlimited replication such as that the chain of replication stops after 12 generations). These may be possible once we have low cost nanoscale 3D printing (which we already have at high cost). So, seed factories could transform large areas of the deserts of Mars with greenhouses made from the sand. These then could provide habitats for the cyanobacteria. With cyanobacteria far more efficient at creating oxygen than normal Earth life, then maybe this could create an oxygen rich atmosphere quickly - first in the greenhouses - and then eventually in the outer atmosphere too. We have an advantage on Mars compared to early Earth that the planet's surface is already highly oxidised. So you wouldn't expect much of the oxygen to be taken up by the soil or subsurface, right away, it would just go straight into the atmosphere. These habitats could cover ponds filled with sheets of cyanobacteria. But - would aerobes and other microbes spoil these plans by consuming the oxygen as fast as it is produced? For all those ideas though, it is relevant to ask if introduced life on Mars could spoil your plans, by transforming Mars in unexpected or unintended ways, for instance, if the wrong species are introduced in the wrong order. I tried to find figures for the amount of oxygen you could hope to create in the optimum situation, using algae ponds like these covering Mars, but haven't yet come across anything at all detailed. Chris McKay comes up with a figure of 100,000 years for the time taken to create an oxygen rich atmosphere with enough oxygen to support humans on Mars. But that is in a different situation, not using cyanobacteria like this, but just with use of similar levels of photosynthetic oxygen creation to Earth as it is now. If anyone reading this knows of a detailed study of this particular aspect - either how long it takes to generate the oxygen - or what the effect of aerobes would be on ecopoesis - do say in the comments. How can Ecopoesis be consistent with a human base on the planet? This picture shows humans living on the surface straight away with a barren Martian landscape in the background. But how can that work at this early stage, before terraforming has begun? How can they avoid contaminating the planet with undesirable lifeforms either as spores or as actual replicating life on Mars? Also not just microbes, multicellular life as well, surely. Most of these studies seem to envisage the whole process of ecopoesis on Mars as overseen by humans living in a base on the planet's surface. But how could that possibly work? Even one visit of humans to the surface of Mars would seem to be enough to put the whole idea into jeopardy. Once you have humans on the planet, then you already have spores of thousands of species in many genera of micro-organisms. They are spread all over the surface of Mars in the global dust-storms, and can survive for years on the surface, and many will get into caves and even just into cracks in the rocks, and permanently shaded locations on Mars. These can survive in dormant forms for decades, and the more sheltered ones surely for millennia. When you have trillions of those spores over the surface of Mars, then there seems no way you could possibly biologically reverse that process. In Christopher McKay's paper he suggested just throwing the dust up into the air to decontaminate after a human landing. But the problem is - it used to be thought that 30 seconds or a minute of exposure to the full sunlight on Mars was enough to kill any micro-organism. It is now known that many spores and dormant states of microorganisms can remain viable after days or months of direct sunlight on the surface of Mars (and much longer periods in shadow). So it is no longer possible to argue like this that the effects of a human base on Mars are biologically reversible. Even if the life doesn't reproduce on Mars, the spores will still be there, and once spread over the surface, can't be removed. With the rovers on Mars already, there seems at least a chance that the spores and dormant micro-organisms remain on the spacecraft or its debris, that they aren't doing anything, just sitting there in their dormant states, and can be removed. The rovers don't breath, drink, eat, and move around as humans do, and their skins don't continually shed micro-organisms into the air as we do. There are far fewer opportunities to spread the micro-organisms on the surface. The original numbers are far smaller (hundreds of thousands instead of hundreds of trillions) and limited to species that survive the cleaning process in the spacecraft assembly clean rooms, and then reduced in numbers by the journey to Mars in the vacuum and radiation of space. With humans, the micro-organisms have no distance at all to travel to reach the Martian surface. It's not going to be practical to clean the spacesuits and airlocks on Mars to the same levels of cleanliness as spacecraft assembly clean rooms, and injuries on the surface, or hard landings can compromise any safety precautions that are taken. This seems an ideal situation for use of telepresence and telerobotics. Humans in orbit around Mars can operate humanoid telerobots on the surface, also rovers and machinery, with near real time capability, just as if they were on the surface themselves. Indeed it is easier because they don't have to wear clumsy spacesuits and gloves. It would of course be done with stereo vision and haptic feedback (so that you can feel what you are doing). All of that is already possible, we have the technology already and it is rapidly developing. That way they can carry out the whole process of ecopoesis without introducing any unwanted micro-organisms to the planet. It seems to me that this is surely the only way that a successful ecopoesis is possible on Mars. We would of course have to remove all the existing spacecraft debris from Mars, or sterilize it, before starting the process, but that seems at least feasible. Or if some species do escape the net, at least there is at least a chance that they won't interfere in a major way with ecopoesis. The original aim for the planetary protection policy on Mars and the COSPAR guidelines was that there should be a chance of less than one in 10,000 of contaminating Mars irreversibly during the exploration phase we are in at present. Probably the chance is a bit higher than that due to many crashes, including orbiters only sterilized to Category III (flyby), and the early imperfect knowledge of Mars and some very early missions that may have been hardly sterilized at all.. But still, it seems generally accepted that there is a reasonable chance that the contamination on Mars hasn't spread yet. At any rate, whatever turns out to be the eventual biological outcome of the rovers we have sent to Mars, it surely won't help matters to add unknown thousands of new species to Mars. If it turns out that we have already contaminated Mars, then I would suggest that we should be even more careful about introducing any other new species to the planet. Normal plant seeds can be sterilized, so seems at least in principle that you could grow higher plants on the surface of Mars without contaminating the planet (as Christopher McKay suggests in his video). You would have to be very careful to sterilize them of all dormant forms of micro-organisms including archaea, the ones you don't want anyway, which might make it harder to do than you expect. Also you have to be careful about micro-organisms that might infect the seeds themselves. But at least a sterilized seed is still viable. At any rate, it is a very different situation from animals, which (usually anyway) can't be sterilized in the same way without killing them. For humans at least sterilizing in that way is surely impossible. Seeds could be sent to the surface as a "proof of concept" without any risk at an early stage, if sterile. Have sufficient studies been made of Pristine Mars to be reasonably sure we aren't about to destroy something of great value by transforming the planet (e.g. clear evidence for a second genesis, early stages of abiogenesis, or understanding why abiogensis didn't happen on Mars)? Do we know how to do it, and have accurate enough long term understanding and models to be confident of the effects and to be confident that the life cycles we set up on Mars will persist long term? Have all the possibilities been considered carefully including pristine Mars, "marsrforming", resumation (or reboot) of abiogenesis on Mars, terraforming, and paraterraforming? Have sufficient studies been made of different ways that the life cycles could be set up? E,g, use of carbonate dissolving micro-organisms to complete the CO2 cycle in place of volcanoes? Will the proposed terraforming work long term over geological timescales? If the terraforming is short term only, has consideration been made to what will happen to any beings on Mars some hundreds of thousands of years or millions of years from now, when the atmosphere is lost or the cycles that maintain current conditions degrade? Given the significance of Mars for humanity as a whole, has this decision been opened to debate and discussed extensively with people representing the Earth (and space colonies too if they exist by then), of a diversity of ethical, cultural and religious or non religious backgrounds? I'm not suggesting we do ecopoesis any time soon. Seems unlikely we will have the know-how to do it reliably for quite a while. We don't know enough to set up the Earth's environment on a lifeless Earth like planet. Indeed we don't yet know how to set up a complex closed ecosystem in a small habitat like Biosphere II. And Mars is different from Earth in many ways. It has no continental drift, and has a highly eccentric orbit, and over long timescales its declination (angle of the axis to the plane of the sun) changes far more than the Earth. These are things that no foreseeable mega-engineering can do anything about. So it needs an entire different system from the Earth one. For instance the carbon cycle on Earth relies on limestone subducted beneath continents and returned to the atmosphere in volcanoes. This depends on continental drift and will not work on Mars. There are ideas for alternatives, but they are just ideas. I think we are a long way from the capability to set up a long term sustainable biosphere over the entire surface of Mars able to last for any length of time. But future humans may have this capability. It might even be within our own reach in the near future if studies of exoplanets and studies of orbital habitats and improving computer simulations lead to rapid advances inour understanding. So, we need to look forward to see what the effect of our current actions might be for future decades and even future generations. For that reason it is important to look at these issues. The way to keep the maximum number of options open for the future is to keep Mars pristine. As soon as we introduce life to Mars, especially if it can't be removed again, then we are closing off possible options that we might wish to take. Future generations might look back at us with dismay if we do that. The biological terraforming of Mars: planetary ecosynthesis as ecological succession on a global scale. Proposal to do experimental ecopoesis on the Moon - so you set up a habitat on the Moon with a Mars simulated atmosphere and surface inside, and then gradually introduce micro-organisms in sequence in an attempt to obtain an Earth equivalent environment. They talk there about the need to use sterile substrates and to introduce the life carefully in succession. This is the link I already gave above, long (non peer reviewed) essay by a microbiologist on Ecopoesis on Mars, with many stimulating ideas..